What is Maha e scholarship? Maha e scholarship is the scheme introduced by Maharashtra government that aims at providing funds for the economically poor students who have secured the best marks in academic studies. Nowadays, a student can apply for the scholarships online easily which help to save more time. However, the old website Mahaeschol is no longer working since the government has changed the name to MahaDBT in 2018. This portal is mainly for the students who wish to earn scholarships. It allows the students who are not able to pay the full fees. The family income is the main criteria for availing a scholarship to gain more benefits. It is a government scheme and reservation plays a major role in determining the eligibility criteria. Education plays a key role in the changing the life of a student and there are different types of education systems followed in various states across India. The numbers of school dropouts are increasing every year in India owing to poverty, poor income, and financial constraints. As a result, many governments offer various scholarship programs for students who are not able to continue their studies due to financial problems and other issues. They involve different types allowing a student to focus more on his or her studies with ease. The scholarships are available for school students and college students allowing them to accomplish goals in their life. The following documents are necessary while applying for MahaDBT scholarship online. How to apply for MahaDBT scholarship online? Anyone who is applying for the MahaDBT scholarship first time can visit the online portal for completing the registration process successful in quick turnaround time. It is advisable to start a new registration with Aadhar card instead of using biometrics because it may take more time to proceed further. One should fill the Aadhar card number for receiving one-time password (OTP) which will help for processing the authentication immediately. Students can create the Username and password after the registration is complete. On the other hand, they should choose a scholarship scheme before filling the details. It is necessary to provide the date of birth, name, education, and other information online. An applicant should wait for some time for getting approval from the concerned authorities. Furthermore, it is necessary to submit the original documents to them after receiving a letter. MahaDBT website allows the students to apply for scholarships without any difficulties. However, one must follow the instructions properly while using the online portal. Those who have forgotten their passwords can reset them through FORGOT options. The details of scholarships are available on the dashboard of the website and students can apply for them as soon as possible. Apart from that, the website provides the updated news of scholarship schemes regularly that cater the needs of students. Anyone who is having doubts can send their queries online that can help to process an application form at the earliest. MahaDBT is the greatest platform for students to apply for a scholarship accordingly. About: Mahadbt Login - Mahadbt is a website of Government of Maharashtra. Please note that the default language of the Mahadbt gov in portal is Marati. To change the default language to English, please follow the below steps which will allow you to view the content of mahadbt website in English. As this website is used mostly by Maharashtra citizens the website displays Marati as default language. To view the website content in English, click on the Languages dropdown which is located on the top right corner of the website. Select English. This article helps you to understand how to do Mahadbt login successfully. Mahadbt allows the people to register online for availing the state sponsored scholarship schemes provided by the Maharashtra Government. Once the citizens register themselves to Mahadbt, they can login any time and use the Mahadbt portal for various requirements. MahaDBT full form is Maharashtra Direct Benefit Transfer. MahaDBT is a website by Government of Maharashtra. Government of Maharashtra offers various social welfare schemes with multiple benefits and subsidies. Maha E-scholarship, Pension, Disaster schemes are few of the social welfare schemes offered by Government of Maharashtra. The purpose of this Mahadbt is to transfer the benefits and subsidies directly into the bank account of the respective beneficiaries. Please make sure that you have registered for Mahadbt online before you try mahadbt login. If you are a registered user, you can follow the below steps to login to Mahadbt online. Visit Mahadbt.gov.in by searching in Google for Mahadbt. Click the one which is official website from Government of Maharashtra. It is https://www.mahadbt.gov.in. Check the right side portion of the website. You will find a small form with Login as heading. Select the user. The options are Resident/Applicant, Institute or Deparment user. If you are an individual person who is a beneficiary of the social welfare schemes, choose the resident/applicant option. If you are logging in on behalf of an institute, choose the institute option. If you are an employee of the department of Government of Maharashtra Mahadbt, then select the department user. 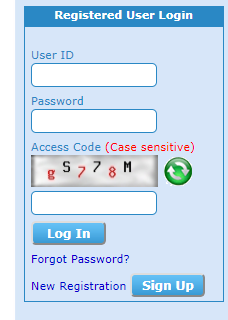 Enter the captcha code which is shown above the text field. Click on Login for mahadbt login. If you have forget the password, please click on the 'Forget the password' option to reset your password. Applicants will receive SMS during the application process to let them know about their application status. Applicants can reach out if they find any discrepancies in their application process. People who have linked Aadhar linked bank account will get the benefit amounts directly to their bank account. This feature helps the applicants not to get into troubles in getting the amount to their bank account after repeated attempts. MahaDBT (DBT stands for Direct Benefit Transfer) is a portal launched by Government of Maharashtra to transfer the benefits and subsidies of various social welfare schemes like E-Scholarships,Pension, Disaster, etc., directly into the bank account of the beneficiary. It is advised for the applicants to enter aadhar number from the academic session 2017 - 2018. Please go through the instructions carefully before filling up the forms in the portal to avoid any mistakes and further problems. You should also check your eligibility for the scholarship in the portal. Kerala PSC One time registration of your profile is very simple process. By following the below steps you can complete Kerala PSC One time registration process. Once you register your profile in Kerala PSC website, you can login anytime with your registered user id and password. We have given the steps to be followed for Kerala PSC One time registration. 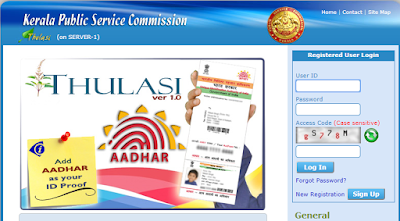 Follow the below steps correctly and create a Kerala PSC login profile. Step 1 - Visit Kerala PSC Website - https://www.keralapsc.gov.in. Step 2 - Click on 'One Time Registration' which you see in the Kerala PSC Home Page. Step 4 - Click on 'New Registration' login below the user id and password options under the heading 'Registered User Login' in the right hand side section. Step 5 - A form for 'New Registration' will be opened in the screen. Fill the required details. Name - Fill the initials at the end of the name. Enter the name once again. Enter the date of birth n the following format DD/MM/YYYY. If your date of birth is Jan 1, 2000, then enter in the following format - 01/01/2000. Enter the date of birth once again in the same format. Enter your ID proof. You can select any of the below id proofs - > Aadhar, Account number of nationalised/scheduled bank, conductor license, Driving license, ID for central employees, ID for Ph.D issued by SW Dept, ID for Uty Insts etc, ID from bar council, ID for ex service man, Pan card, passport, PEN for state employees, Voters Identity card. Enter your ID proof number. Enter Aadhar number if available. Enter user id without spaces. You have to remember whatever you are entering in this field as you will be using this user id forever. Enter the user id again to confirm. Confirm the password by entering again. Enter the access code as you see in the screen. It is case sensitive. Check the option that you declare that the information provided by you is correct and complete to the best of your knowledge and belief. Technologies have improved a lot these days and applying for a job is a simple one due to the revolution of the Internet. Kerala Public Service Commission, shortly known as KPSC, is the latest website launched by Kerala government for the job aspirants. Getting a government job is a dream of many people in India and they try to put their maximum efforts in achieving the same. Each state in India follows different procedures in the recruitment process and those who want to apply for the jobs must know more about them in detail. One can browse jobs under various categories enabling the applicants to process an application according to needs. The onetime registration is a simple process, but one should consider certain things for processing an application form with ease. Kerala psc one time registration profile login - Now you know the process of Kerala PSC one time registration. We will meet you with another informative article. Earlier, it becomes a difficult one to apply for a government job in a state at the right time. In order to solve the probaclems of applicants, many state governments have instituted a public service commission which aims at scrutinizing the applications forms of job seekers quickly. What is KPSC Thulasi - Kerala PSC Thulasi? KPSC Thulasi website is mainly meant for those who want to apply for the government jobs in Kerala. It covers the latest information of job vacancies available in various sectors. Another thing is that it comes up the notifications for reserved categories. Anyone who is willing to apply for a government job must register on the website that gives ways for receiving the notifications quickly. It provides the information about jobs which are available under KPSC. An applicant should submit his or her photograph that is less than 30kb size with 150 w X 200 H pixel resolutions. It is necessary to specify the name at the bottom of a photo after the uploading process. In addition, one must submit his or her scanned signature file which is less than 20kb size. At the same time, both the files must be in Jpg format for easy approval. The applicants should submit the personal details after uploading photos and signature. They should match exactly written in the ID proofs. It is an important one to provide the mobile number and email id in the application forms. Apart from that, they should mention their educational qualifications at the time of applying for a job. 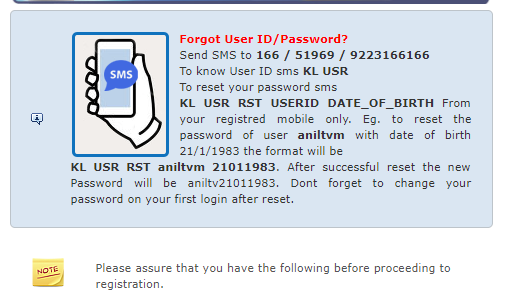 Furthermore, it is possible to create a user ID and password once the registration is successful. This will help for the future logins to know more details about the jobs and other things. Anyone who wants to download the hall tickets and have queries will receive notifications thorough email or mobile phone. 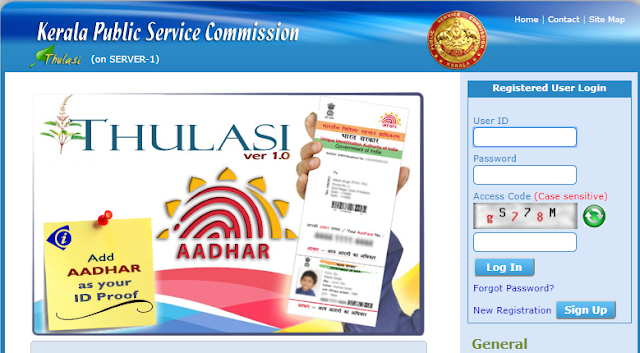 How to reset the password - Kerala PSC Thulasi Login - Password Reset? 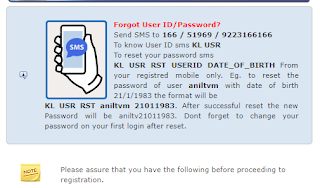 Sometimes, applicants find it difficulties to login in KPSC Thulasi due to forgotten user ID and password. In such cases, they can send an SMS to 166, 51949 or 9223166166 through their registered mobile number. This, in turn, paves ways for generating a new password immediately. The applicants should focus more on reading the instructions carefully while processing an application form online which ultimately helps for accomplishing goals. Anyone who is facing difficulties in filling the application forms can get guidance from others for overcoming complications. The KPSC Thulasi registration page is meant for people who are applying for the government jobs first time. It even allows a person to receive the notifications on the latest jobs. For those who want to get more ideas about the registration and other details, the FAQ section page will guide them to process an application. Previous year KPSC question papers are available for the applicants to clear an exam with high scores. It could be that you are interested to purchase plywood in huge volume for your business or for home to meet various purposes. Whatever be it, there is a need to undertake thorough research before actually making the purchase, to ensure that you make a well informed decision. 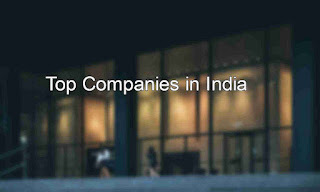 Getting to know the top companies operating in the company and their reputation can help you with your decision. It is a reputed name in the plywood companies industry, being established in 1986, having over 27 years of expertise and experience in dealing in top quality ply boards. This company deals in plywoods, plywood related products, Nesta, decorative laminates, decorative veneers and Exteriatm. The company was founded by Mr.Sajjan Bhajanka and Mr.Sanjay Agarwal. It is the first ISO 9002 company in India for veneer and plywood. They are the first plywood company in India to introduce Borer-Proof Plywood in India. Cement plays a very vital role in constructing a building. The quality of the cement determines the life of the building. It is very important to choose the best cement in order to build your dream house or office. Cement manufacturing plays a major role in the growth and development of the nation and help in the infrastructure modernization. In this article we have done a lot of research and listed out the best cement brands that are available in India.